With a Thai name that we’d translate as “House Down a Lane,” Baan Glang Soi offers 10 spacious rooms on a colourful side street with easy access to the river boats, the skytrain and an abundance of street food. 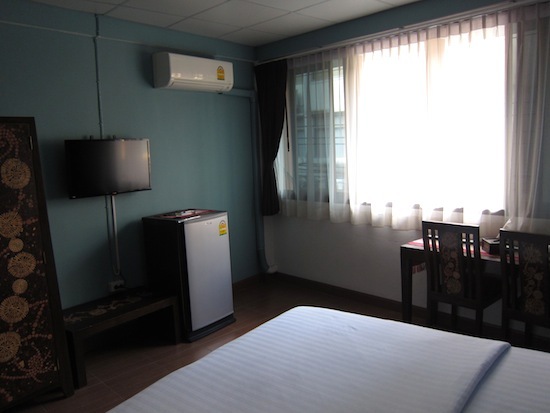 This is excellent value in a part of Bangkok where clean and well-equipped rooms are hard to find for under 1,500 baht a night. Average rating 8.7 from 207 reviews. The soi of Baan Glang Soi. Spread across two upper floors accessed by stairs, the rooms are a lot bigger than we expected; many hotels in the Silom area sell rooms that can barely fit a bed for the exact same price. Each of Baan Glang Soi’s rooms come with enough space for a few guests to do yoga or lay out a bunch of maps on the floor. All rooms are similar but the pricier editions come with extra beds, making this a good choice for families. Each room is outfitted with (at least) a firm king-size bed with soft linens; desk; free WiFi that works well on every floor; larger-than-average fridge; LCD TV; air-con; hardwood bureau adorned with tasteful designs; and good-size hot-water bathroom with modern appliances. Large tinted windows are also found in all rooms, and at least two of the upper-floor versions bag you balconies with street views. An atmospheric restaurant occupies the ground floor and serves an eclectic menu, including handmade cocktails from the small bar. We’ve yet to try the food but feedback has genearlly been positive. 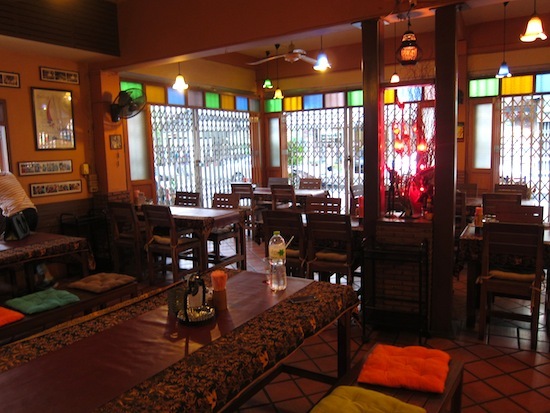 The European owners and Thai staff seem to do a good job of taking care of guests, and we appreciated the relaxing atmosphere — not the least bit pretentious but also not boring. In short, we felt like hanging around. 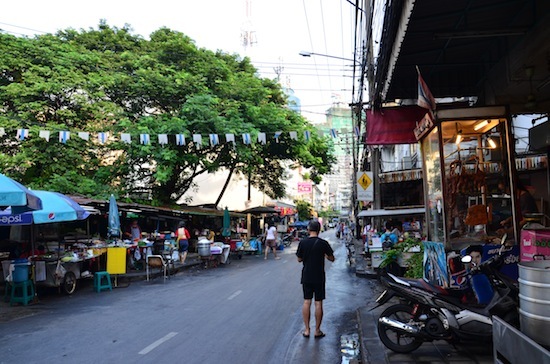 The location is another major selling point; in fact this is one of our favourite neighbourhoods in Bangkok. 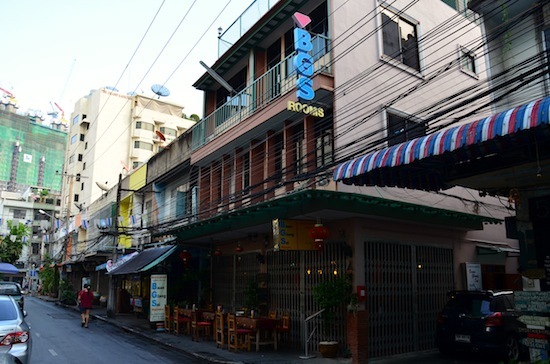 You’ll find a bunch of local-style eateries and street carts up near Charoen Krung Road, and Baan Glang Soi is located far enough down the lane that it should stay reasonably quiet. Saphan Taksin BTS station and the central Chao Phraya express boat pier are less than a 10-minute walk away. Poke around the old European quarter on the other side of Charoen Krung and you’ll find several antique art galleries and some interesting architecture, including Assumption Cathedral. This is also where you’ll find the SkyBar at Lebua State Tower (made famous by the movie, The Hangover 2) and the historic French and Portuguese embassies. Enter through a side door when the resto is closed. If you like this area but want to spend less money, give New Road Guest House a try. If you can spend a bit more cash and would prefer a more standard hotel-style experience, Bossotel is a decent option. There’s also the nearby Escape at Sathorn Terrace, another small hotel with similarly equipped rooms for a bit more cash. Check rates at Baan Glang Soi on Booking.com.